The Ozark cavefish is small, colorless, and blind, with a flattened head and slightly protruding lower jaw; the tail fin is rounded. Cavefish live most or all of their lives in total darkness and lack eyes. Two other cavefish species are found in Missouri. The spring cavefish is known from only one site near Cape Girardeau; it is pigmented yellowish brown to brown, and it has small eyes. The southern cavefish lives in the central and southeastern Ozark region. It is hard to distinguish the Ozark cavefish from the southern cavefish, but their ranges do not overlap. Occurs in cave streams and springs with a gravel bottom, or occasionally in pools over silt and sand bottoms. Restricted to areas of limestone and dolomite bedrock containing caves, sinkholes, and springs. Conservation efforts include protecting a cave's recharge area, minimizing disturbance to cave wildlife, and protecting cave entrances. A cavefish uses sense organs located on the sides of its head, body, and tail to find food such as plankton, isopods, amphipods, crayfish, salamander larvae, and bat guano. Caves have a limited supply of food and nutrients, so cavefish depend on resources brought in from the outside. Leaf litter, sticks, and bat guano are important sources of organic nutrients in a cave's ecosystem. Ozark cavefish are often found near bat roosting areas. Found in the Springfield Plateau of the Ozark Highlands in southwest Missouri, northwest Arkansas, and northeast Oklahoma. 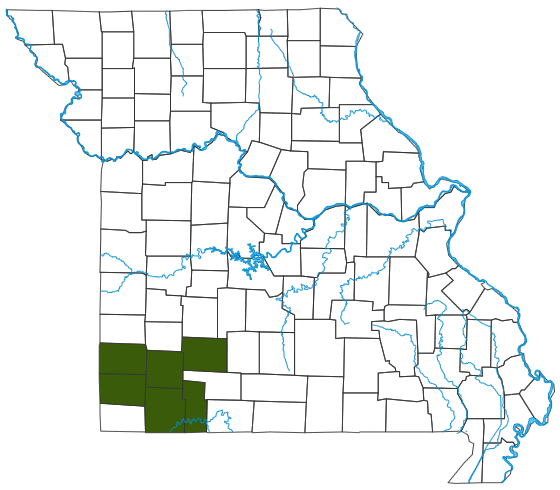 Thirteen Ozark cavefish sites are known to exist in Missouri, in Newton, Jasper, Lawrence, Greene, Stone, and Barry counties. Listed as Endangered by the Missouri Department of Conservation and Threatened by the U.S. Fish and Wildlife Service. Little is known about the Ozark cavefish's life cycle. Spring floods probably trigger spawning, which occurs from February to April when waters are high. Females probably produce about 20 eggs, which the female collects in her mouth, then shifts to her gill cavities. Eggs remain in the gill cavities until they hatch 4–5 months later. Ozark cavefish have a low reproductive rate. It is estimated that 20 percent of the mature females spawn each year. Cavefish can live 10 years or more. Human wealth takes many forms, in addition to the common sense of “money.” That Missouri — the Cave State — is blessed with such interesting subterranean features and an abundance of fascinating, rare, and elegant creatures, makes us rich beyond description.